CLEVELAND, Ohio – Phil Steele released the 2014 postseason football awards, Friday, Dec. 19 and four New Mexico State football players have been named to the All-SBC (Sun Belt Conference) team with three on offense and one on defense. Redshirt sophomore wide receiver Teldrick Morgan and senior center Valerian Ume-Ezeoke were named to the first team offense, while freshman running back Larry Rose III was a third team selection. Sophomore linebacker Rodney Butler was the sole defensive selection being named to the third team. Morgan and Ume-Ezeoke were already honored as all-conference selections by the league office as a second team and first team selection respectively. Morgan, a native of Hanover, Md., walked on with the Aggies in 2013 but was a key player for the Aggie offense in 2014. Morgan led the Aggies in all receiving categories including number of receptions (75), receiving yards (903), average yards per catch (12), receiving touchdowns (7) and average per game (82.1). 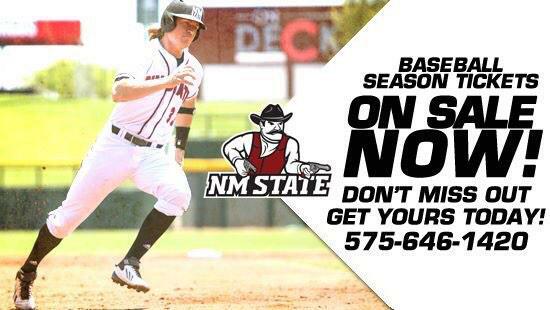 He played in 11 games for NM State during the season. Morgan finished the season No. 2 in the SBC in receptions per game with 6.8 and No. 14 in the nation. He was also No. 2 in the SBC in receiving yards per game (82.1) and No. 26 in the nation. Morgan also finished No. 6 in the Sun Belt and No. 46 in the nation in all-purpose yards (1,361) and in all-purpose yards per game (123.7). He ended the year No. 5 in the league in kick return average (22.7). He finished with 903 receiving yards on the year, which ranks him No. 38 nationwide. Morgan was also named to the Biletnikoff Watch List in 2014 and was also an honorable mention selection for CollegeFootballPerformance.com for his play during week 11. Ume-Ezeoke did not give up any sacks during the 2014 season and was responsible for giving up only one sack throughout his entire career. He led an Aggie offensive line that allowed only 10 sacks on the season, ranking them No. 2 in the SBC and No. 4 in the nation. He led the team in 2014 in knockdowns and pancakes with 39 and 23 respectively; He came up with a total of 62 (total) knockdowns. Ume-Ezeoke led the offensive line helping running back Larry Rose III gain over 1,000 yards this season. Rose III is the first player to surpass the 1,000 mark since 1995. His offensive line play helped the Aggies to No. 5 in the SBC in total offense with 418.2 yards per game. Rose III led NM State in rushing attempts (186), rushing yards (1102), average per carry (5.9), average rushing yards per game (110.2) and rushing touchdowns (9). He is No. 3 in the Sun Belt Conference in rushing and tied No. 8 in scoring (touchdowns) in the SBC with nine (60 points). Rose III is also No. 4 in the SBC in all-purpose yards with 1,274 total yards and No. 39 in the nation in all-purpose yards per game with 127.4, while No. 2 in the SBC in the same category. Although he only played in 10 games for the Aggies he was still leading team in every rushing category in 2014. Rose III tallied 23 receptions for 172 yards and one touchdown. He posted a career-high 229 yards and two touchdowns on 35 carries against UL Monroe Nov. 22. Rose III is No. 25 in the nation in rushing yards per game with 110.2 per. Butler finished the season leading NM State in tackles with 119; 61 assisted and 58 solo. He recorded 7.5 tackles for a loss of nine yards and pulled in one interception which he returned 40 yards for a touchdown against Georgia State. Butler recorded two forced fumbles and one pass break up. He is No. 2 in the SBC in total tackles and No. 20 nationally (119 tackles). He also helped the Aggies to the No. 7 ranked pass defense in the nation, allowing only 174.5 yards through the air per game. Butler was also on Phil Steele’s midseason all-Sun Belt Conference team. Fans and followers of Aggie football can keep up with the team online at the official website of NM State Athletics at www.NMStateSports.com.